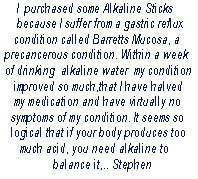 Undersink Reverse Osmosis incorporate the Alkaline Filter as an option. The ability to enhance the health properties of water using natural ore volcanic minerals provides an easy and convenient means to keep healthy. All Purestream Alkaline filters contain oxygenating and alkalising ceramics. All Purestream Pi Alkaline Water Filters have been formulated in conjunction with a highly regarded Science Technology Co. located in China, who, in conjunction with a number of universities, is involved in the research, development and manufacture of ecological healthy ceramic materials, specifically for water treatment.